This is the first paperback edition of The Wailing Wind, published by HarperTorch in 2003. The cover is similar to the hardcover dust jacket designed by Peter Thorpe for the first edition in 2002, and features a Yei figure in sandpainting style in front of a blue rectangle and a desert landscape scene. 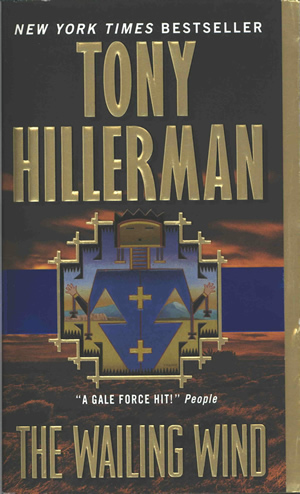 The inside front cover contains the publisher's logo and price, praise for Tony Hillerman, and bar code. The publisher's name, fiction designation, author's name, title, and "New York Times Bestseller" are printed on the spine. The inside back cover contains 2001 author photo by Kelly Campbell and brief author biography. The back cover features praise for Tony Hillerman, the publisher's web address, bar code and price. Contents: [i-v] Praise for Tony Hillerman, [vi] Also by Tony Hillerman, [vii] title page, [viii] fiction disclaimer and copyright, ix-x Author's Note, [xi] half title, [xii-xiii] map, [xiv] blank, 1-334 text,  intro to synopses, [336-352] synopses of other Hillerman novels,  advance notice for The Sinister Pig,  list of publisher's Hillerman editions and prices,  author photo and bio. Binding: Full-color paper covers. Title and author's name are lettered in gold.